I’m on Filipino Time. That’s my excuse, anyway, for not having any new posts in over a week. Sure, I could blame the Manggahan Festival now being held in Guimaras, the island province my asawa and I live on, but using “Filipino Time” sounds like a good scapegoat for my laziness. But I did manage, however, to snap the following digital photographs using our new Sony CyberShot camera. Our old camera’s battery died and it would cost almost 3,000 pesos to replace it. So we opted for a new camera that cost 7.000 pesos and has 21 megapixels and eight times zoom. Our old model had 12 megapixels and four times the zoom. 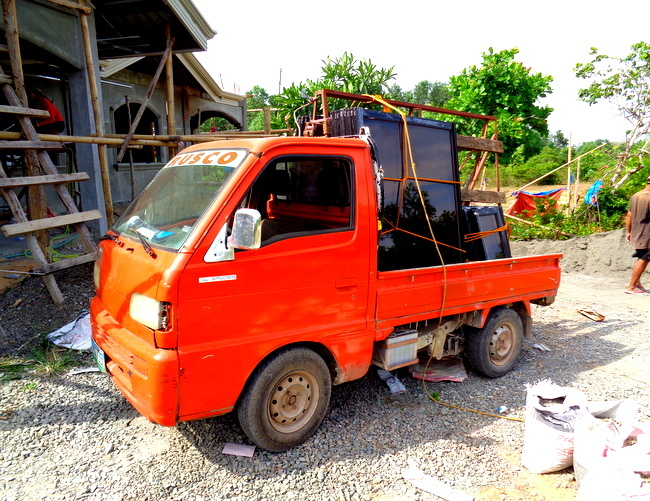 Readers from “The Rooster Crows at 4am!,” my first blog I started over five years ago, a month after moving to the Philippines, might recall how I left my asawa’s favorite Sony digital point-and-shoot camera in the pocket of my cargo shorts. Our laundry lady at the time washed the shorts along with the camera. My wife wasn’t too happy with me. We purchased a new camera back then and it has worked great until now. “The Kano” gets a close-up of the new windows. The two pictures above gives you an idea of the windows we ordered for our new home. 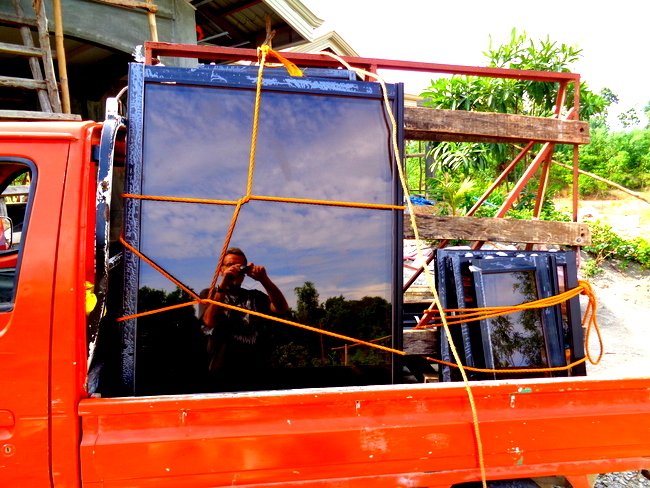 I was impressed that the glass company, Guimaras Glass, made a delivery in less than two weeks of ordering the glass. 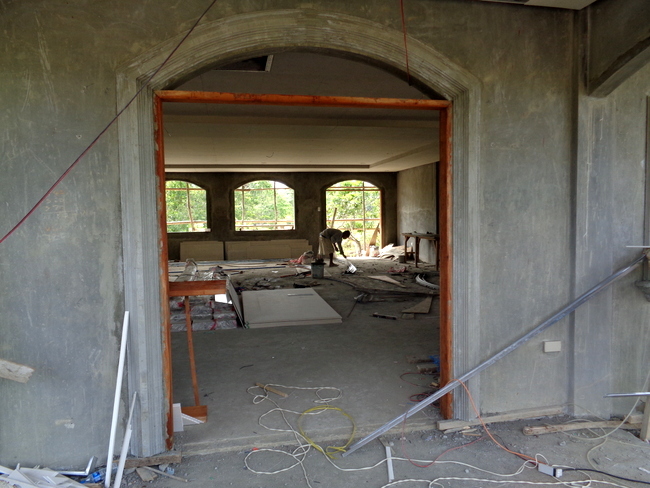 We’re still waiting on doors, which are supposed to be delivered this coming Saturday. The doors were ordered over two months ago. Our foreman, Boy, is hard at work. making the precast concrete forms that can be seen in the above shot and in the next three pictures. This added architectural detail cost about an extra thousand dollars, US, but well worth the money in my opinion. I have to give my asawa credit for this feature. She’s come up with a lot of good ideas that we’ve managed to get incorporated in the house, such as the arched windows and doorways seen in these photos. 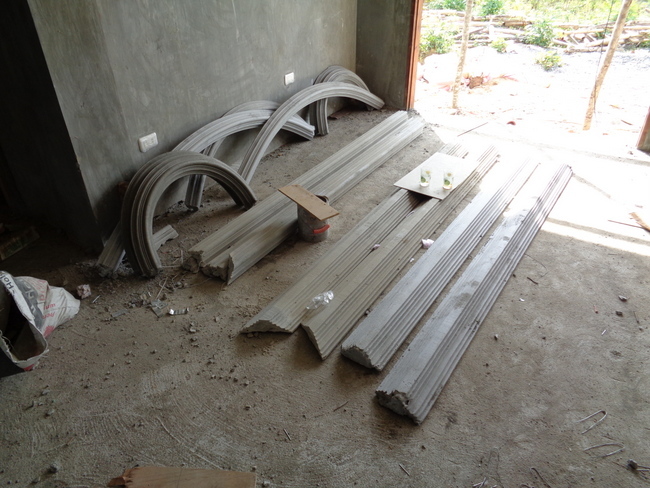 Take a peek at the granite slabs we ordered from A.M. Builder’s Depot in nearby Iloilo. We’ll be using these in our kitchen. And note to Bill S, I still forgot to measure the width of these slabs, but this was the only thickness we could purchase the granite in so we’ll have to make do with what we have. Here’s the kitchen area where the granite counter tops will be installed. 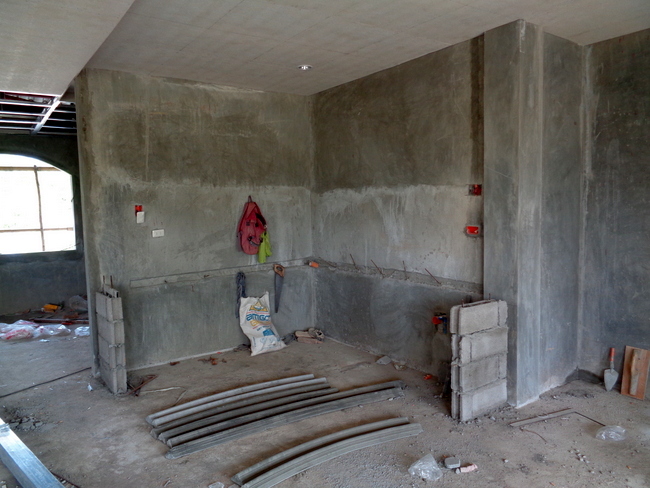 This is a peek inside our living room where our bags of concrete are being stored. 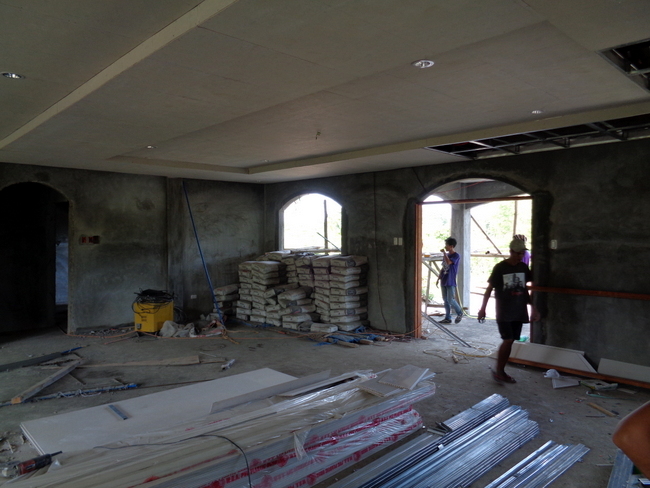 The ceiling installers are making good progress and the electricians have installed the recessed lights. That’s my lovely asawa in the next shot, standing in front of our new dirty kitchen. 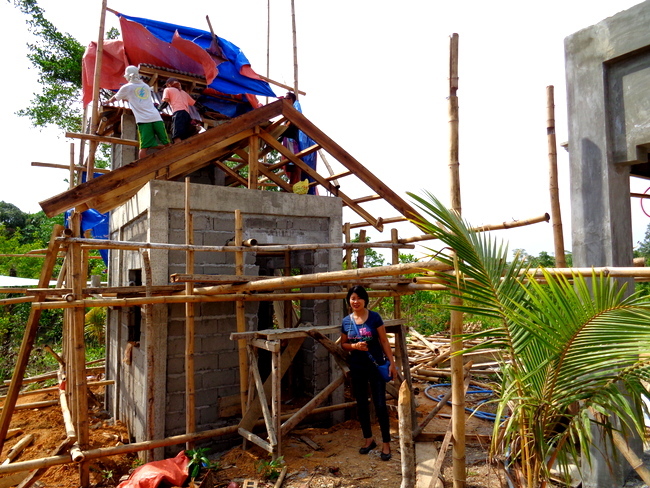 Brother-in-law Joery and crew were installing the roof on the structure that day. The wind-torn tarp offered the men little protection from the torrid sun but it didn’t slow down the guys. 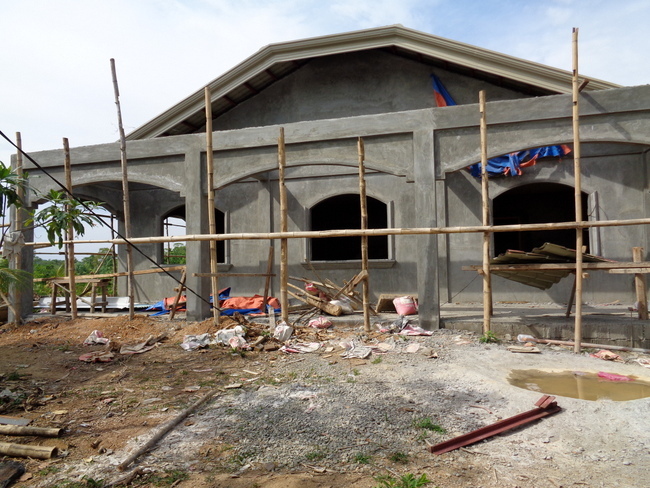 The tile for our floors and comfort rooms have been delivered and work continues to progress at our new home in the Philippines. I would estimate that we might be able to move in this July. Construction began in mid-January of this year and my wife and I are looking forward to living in our new digs. Whether or not I’ll be posting on a more frequent basis at that time remains to be seen. I am retired and unlike some “retirees,” I excel at doing nothing. anyway enjoy the festival. and i’m sure there will be some good pictures to follow from that new camra. Thanks, Roger. Yes, the smooth finishing has been completed. 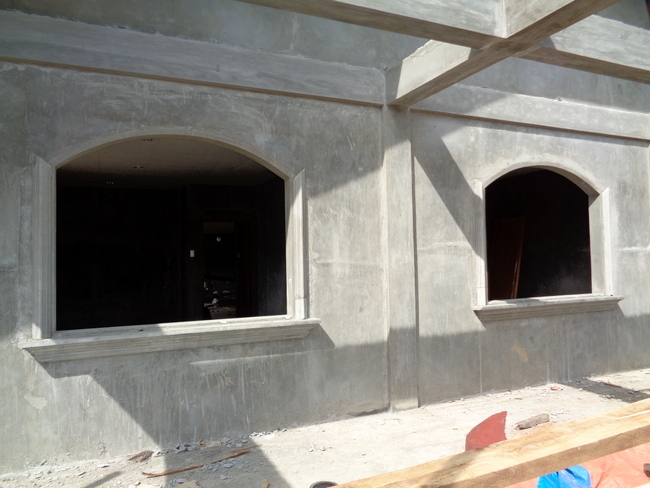 We will try to get the outside painted before the rainy season hits. We’re looking at various paint samples now. We have found some kitchen cabinets we like but the hardware store we found them doesn’t have enough cabinets in stock now. We’ve checked back with them but they don’t seem to motivated to order additional stock so we will probably look elsewhere. Manggahan pics are coming up. Take care. you would think they would want to order your cabinets and make the sell. but then that would only make since. or i’m thinking maybe the cabinets you like they can’t get them anymore. maybe the guy making your doors can design and custom build them for you. Well, our brother-in-law could make mahogany cabinets for us, Roger, but my asawa wants white PVC cabinets she saw in Iloilo. We will check out some other places in the big city and see if we can find what my wife likes. Looks like its progressing just fine. 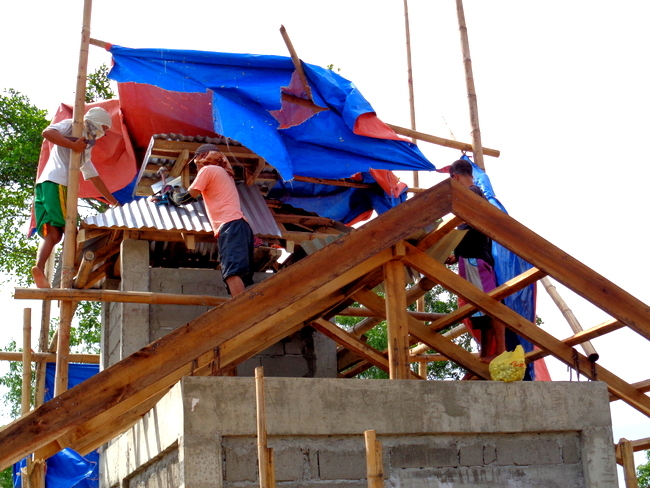 Maybe it will be completed before the heavy rains start. We made it back alright. Just getting over the jet lag. Couldn’t sleep on the long flight across the water. Glad to hear you’re back, Papa Duck. I can never sleep much either on that long flight, maybe 10 or 15 minutes at the most. All I can say is your house is big Dave.i guess there’s a lot of rooms available for guests.congrats. Thanks, Rey. We needed room for our niece and nephew living with us and our housekeeper. It will be the last place my wife and I will probably ever live in so we wanted to make sure it had plenty of room. Very impressed with the quality of the construction, I like the pre-cast window casings especially, I definitely would like to do that also. Cant tell about the thickness of the granite from the pictures since there is nothing to reference too, but looks like they may be thicker than the ones I saw there in a few houses that were only 1/2″ thick. for exterior siding on 2 houses before, but have never used the larger panels before for anything. Thanks, Bill S, I, too, like the pre-cast. I never had heard of it before but I’m glad my asawa suggested it. I, think the granite tops are also more than an 1/2″, also. Going to the site again today and I hope to remember to measure them. Good question about the skim coat, Bill. I will check with my spouse and the ceiling installers. The ceiling would look better with a skim coat, however. 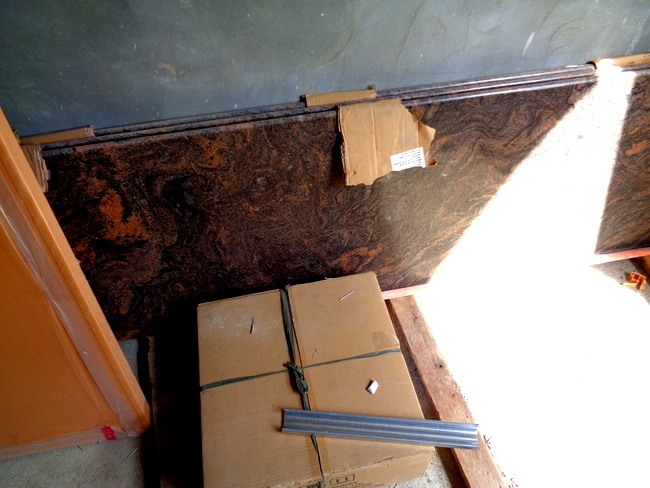 Bill S, the granite slabs are one inch thick (I finally measured them) and we will be using a skim coat on the ceiling. Hi, Manny, thanks, glad to hear your family is planning a move to Guimaras, good choice. Well, I will have to check with Boy to see what his email address is. His name is “Boy” Galledo and his local number is 0915541315. His English is limited and my Filipina wife discusses most building and design issues with him. 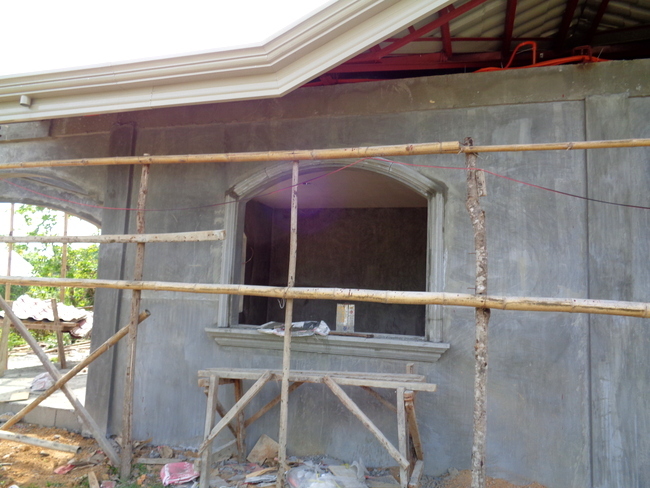 Well, we hired Boy’s architect who designed the house though my asawa suggested the arched window and door designs. I personally would suggest using PVC material on the outside soffits as marine plywood will eventually discolor and with pvc or some time of plastic material, you can avoid termite damage. We also have PVC kitchen cabinets and not wood to avoid termite and humidity damage. I will be publishing more pictures of the house in the near future. Good luck and I will advise you if Boy has an email address or facebook account. Take care.